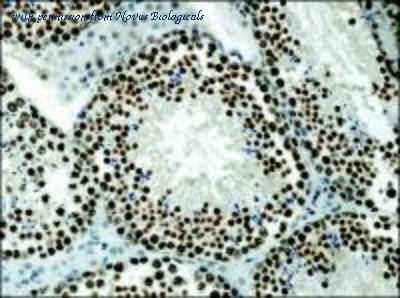 Western Blot: Histone H3 Antibody [NB500-171] - HeLa (lane 1) or S. cerevisiae (lane 2) whole cell lysates. Histones purified from HeLa cells (lane 3). Immunohistochemistry: Histone H3 Antibody [NB500-171] - Analysis of Histone H3 in human breast cancer using DAB with hematoxylin counterstain. 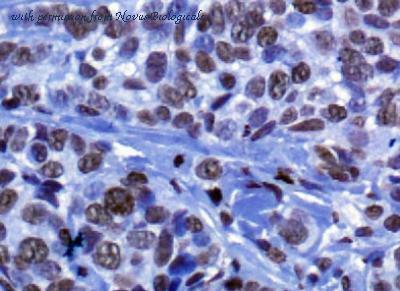 Immunohistochemistry-Paraffin: Histone H3 Antibody [NB500-171] - Immunoperoxidase staining of Anti-Histone H3 in formalin fixed, paraffin-embedded mouse testis. 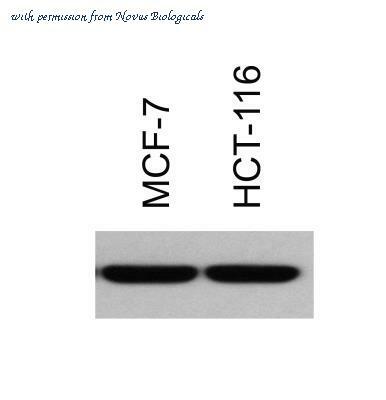 Western Blot: Histone H3 [Trimethyl Lys9] Antibody (6F12-H4) [NBP1-30141] - H3K9Me3 analysis of MCF7 and HCT116. Image from verified customer review. Chromatin Immunoprecipitation: Histone H3 [Trimethyl Lys9] Antibody (6F12-H4) [NBP1-30141] - Used to perform ChIP on Hela cells. 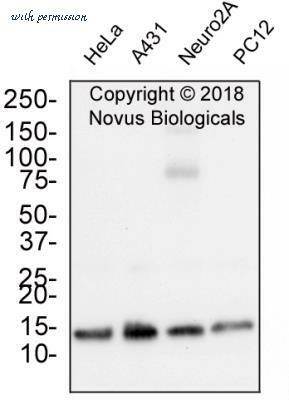 Dot Blot: Histone H3 [ac Lys4] Antibody [NB21-1024] - Histone H3 [ac Lys4] Antibody [NB21-1024] - Dot blot analysis of Histone H3 K4ac antibody in picomoles of peptide. 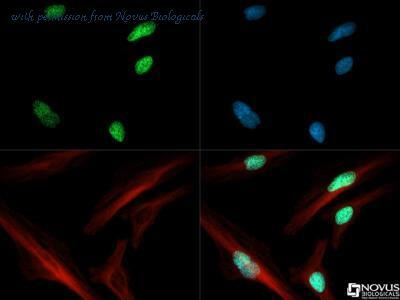 Immunocytochemistry: Histone H3 [ac Lys4] Antibody [NB21-1024] - Immunofluorescence: Histone H3 [ac Lys4] Antibody [NB21-1024] - Histone H3 K4ac1 antibody was tested in HeLa cells with Dylight 488 (green). Nuclei and alpha-tubulin were counterstained with DAPI (blue) and Dylight 550 (red). 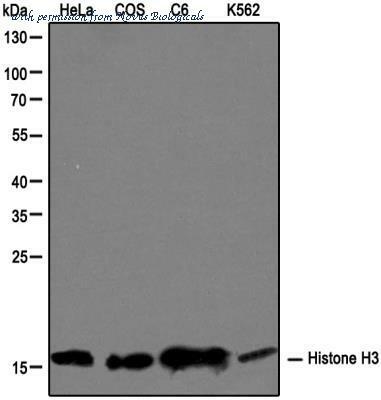 Western blot analysis of Histone H3 (Acetyl-Lys9) using 3T3 cell extracts treated with TSA. Lane 1: Molecular Weight Markers, Lane 2: 3T3, Lane 3: 3T3 + TSA. 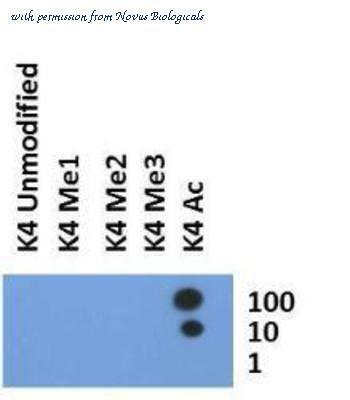 Western blot analysis of MW marker (1), 3T3 (2), and K- 562 (3) cell lysates probed with Histone H3 (dimethyl-Lys9) pAb.